All the houses in Bramble Row will be Passivhaus, which means they have been designed from the start to have an extremely high standard of energy efficiency and comfort. Their environmental footprint will be much lower than an average house due to super insulation, triple glazed windows and advanced ventilation. It’s a win-win situation, as it reduces your impact on the environment and makes your life better as well. In an ordinary building, there can be a lot of heat loss due to ‘Thermal Bridging’. This is where a material that conducts heat directly connects the outside with the inside of the building. This can be around windows or where part of the structure goes right through the wall – for example lintels, a balcony or wall ties. There can be less insulation where floors and walls join and at any junction, which can also cause thermal bridges. According to the Building Research Establishment (BRE), up to 30% of the heat loss from a building can be from thermal bridging. Thermal bridges can also cause cold patches on walls, on which condensation and mould can form, causing health problems. A Passivhaus building, however, has the same thick, insulated structure around the whole outside of the building – walls and roof. The junctions are carefully managed as part of the construction to ensure there are no thermal bridges. 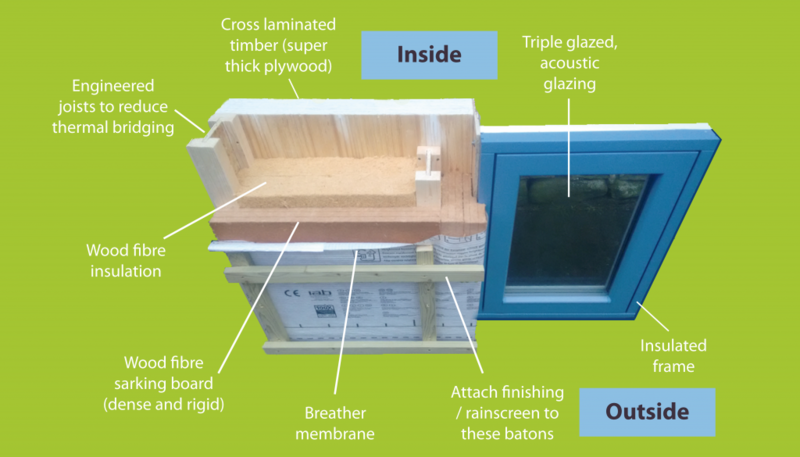 A Passivhaus has a very high standard of airtightness. This is important, as it reduces heat loss and also draughts, making it more comfortable to live in. If air is getting into the fabric of the building through leaks, it can also cause damage, dampness and mould. 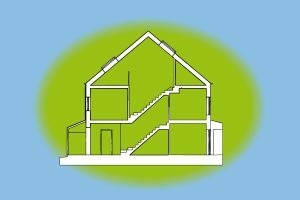 You can download the Passivhaus Airtightness guide which explains the causes and effects of air leakage, how it affects the building fabric and how airtightness is achieved in a Passivhaus building. 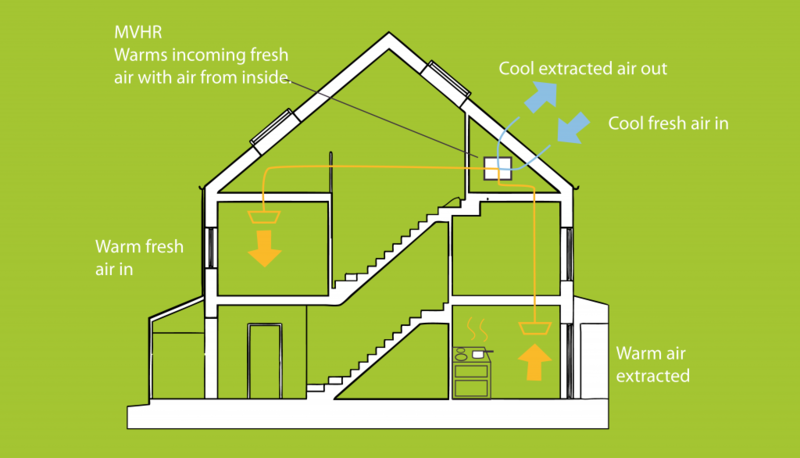 Each house will have a Mechanical Ventilation and Heat Recovery unit (MVHR). This constantly brings fresh air into the house, which it heats up with the outgoing air before it is released outside. So there is good air quality without draughts. The shape, aspect, shading and windows are designed so the house is heated by the sun in winter but does not overheat in the summer. The cost price of a Passivhaus will be comparable with similar sized ordinary houses – but with less than a fifth of the heating bills and low maintenance costs due to the very high quality materials. So in the long run, it will be much more affordable.